The Government is trying to kill the Jan Lokpal. Just weeks after promising the country tough new laws on corruption, they’re attempting to scuttle this once-in-a-generation opportunity byremoving its most important parts — its authority over the Prime Minister, Judiciary, and all sitting Members of Parliament. We need to act urgently to save the Jan Lokpal! On the same day that it slashed the Lokpal’s most vital protections, the government launched a process for public input on the Lokpal. If we harness this tool to immediately flood the Ministers with public comment demanding an effective Lokpal, we can revive this crucial anti-corruption legislation ahead of the final scheduled drafting committee meetings next week. Let’s send a strong message to the Lokpal authors: don’t kill the bill. Click below to submit a comment directly to the government’s input tool and the inboxes of the Ministers drafting the Lokpal, Prime Minister Singh, and key Lokpal supporter Sonia Gandhi! Then send this action on to every friend or family member who cares about the future of India! On Monday, government ministers in the Jan Lokpal Drafting Committee took a massive step backward in the race to clear corruption from Indian politics. The anemic Lokpal draft they presented would only govern a few senior bureaucrats — leaving all top elected officials, like the MPs involved in cash for votes scandals, to “self regulate”. Instead of a powerful body up to the task of tackling a massive problem, it would be a small bandage on a massive wound. The government’s back-peddling threatens the whole Lokpal. Ministers pledged to finalize a draft bill by 30 June, in time to be considered in the monsoon session of parliament. But these changes open the very real possibility that 2011 will join the list of years in which the Lokpal tried — and failed — to become law. 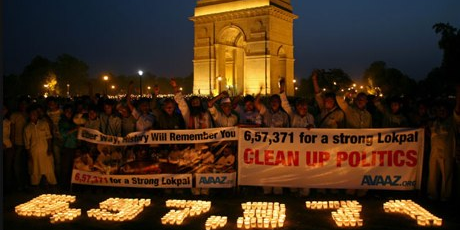 People power brought the Lokpal within reach. Our pressure brought Sonia Gandhi to give the bill her blessing and catapult it from the annals of history to a fast-tracked drafting committee. But change is hard, and we must remain vigilant to see the Lokpal through to a new era of a corruption-free India. Let’s stay strong now, while our pressure is urgently needed.